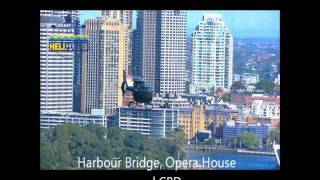 For absolutely unbeatable views of Sydney's most famous icons, look no further than Sydney HeliTours! Hop aboard one of their helicopters to enjoy amazing views of the Harbour Bridge, the Opera House, the spectacular city skyline and some of Sydney's most beautiful beaches. In addition to the range of scenic flights, they offer a fabulous selection of luncheon tours. Arrive in absolute style for lunch in one of the many destinations they fly to, such as the Hunter Valley, the Blue Mountains and Terrigal Beach. For the thrill seekers, they are the only helicopter tour company offering flights with doors off and performing aerial manoeuvres along Sydney's magnificent coastline. For special occasions, why not privately charter a helicopter to create a flight all of your own? The sky's the limit! For passenger convenience, complimentary city-hotel shuttle buses are included with all tours.